CW18 Milwaukee wants you to Dare to Play and Defy the Competition with all-new episodes of FAMILY FEUD! The classic game is better than ever thanks to the swagger of host Steve Harvey! We're partnering with Jammin' 98.3 to hook you up with tickets to see Momma's Boy, the play featuring an all-star cast that asks what happens what a mother holds on to her son too long, coming to the Miller High Life Theatre Friday, November 17th! Watch all-new episodes of Family Feud, weeknights at 6 & 6:30pm on CW18 for each night's secret word. Then, listen to Jammin' 98.3's Earl Stokes the following weeknight at 5:30pm for a chance to call in to win! It's that easy! Good luck from Jammin' 98.3 and CW18! 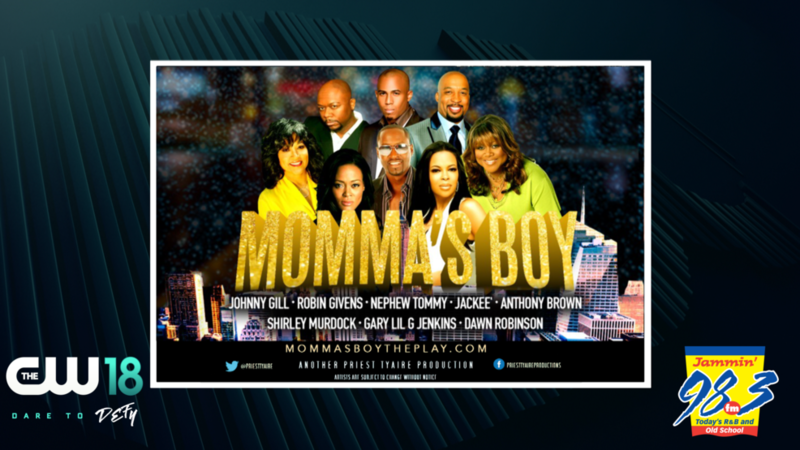 Momma's Boy is a Priest Tyaire Production featuring a star-studded cast, including: Johnny Gill, Robin Givens, Nephew Tommy, Jackee', Anthony Brown, Shirley Murdock, Gary "Lil G" Jenkins, and Dawn Robinson. Tickets are available now. What happens when a mother holds on to her son too long? That’s precisely what we learn as this all-star cast unites to tell the story of a young man who takes pride in being macho but really is a momma’s boy. Set in the inner city, Aaron and Autumn join forces as police officers in a town plagued by violence. Autumn is then forced to move into Aaron’s home with her sons. Autumn has spoiled and catered to her sons every need which has earned them the title of being momma’s boys. This is where Aaron’s plight begins to turn these boys to men. In an awkward turn of events, Autumn decides to confront Aaron about his own relationship with his mother. Aaron’s mother, who has resided with him for the past 10 years, feels that no woman can take care of her son like she can. She has run away potential prospects in the past and intends to do same with Autumn. The big question that remains is how can Aaron turn Autumns boys into men when he is a “Momma’s Boy” himself?